Deliver a complete view of your customers for your Sales and Support teams with a dynamic two-way integration between Zendesk ticket data and Microsoft Dynamics 365 customer data. 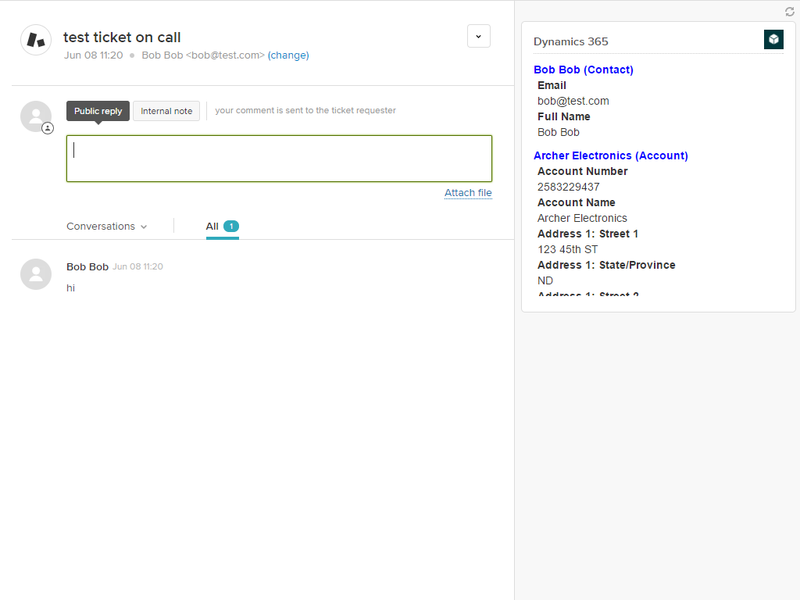 The Dynamics 365 Connector allows account, contact, and/or lead data to be displayed when viewing a ticket within Zendesk. 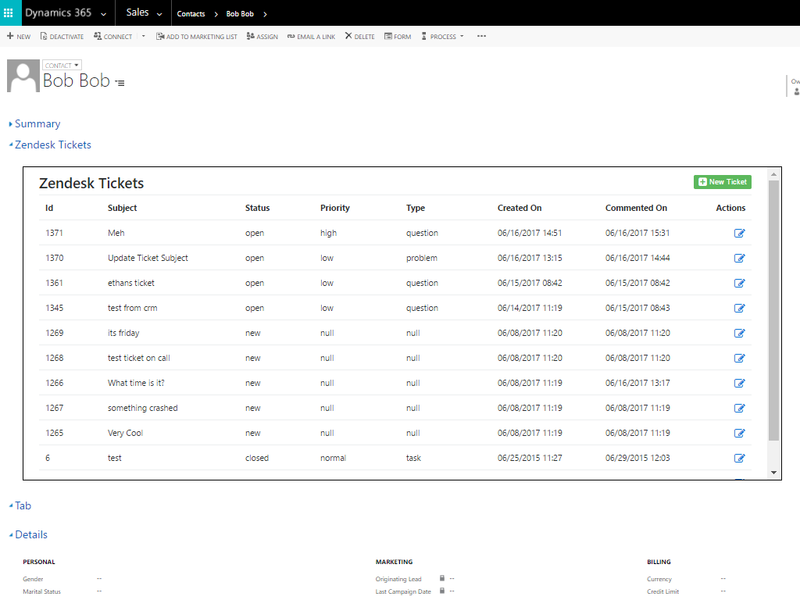 It also includes a ticket grid that can be deployed in Dynamics 365 that allows users to view, update or create tickets from the Dynamics 365 system. Get more visibility on relevant customer data, such as customer account size or contract status, from Microsoft Dynamics 365 on Zendesk ticket pages. Enable your Support team to deliver a personal service experience and ensure customer satisfaction with customer profile information from Dynamics 365 in their Zendesk view. Easily collaborate to resolve customer issues faster with access to support ticket information in a custom Zendesk panel within Microsoft Dynamics 365. Stay up to date on the status of the account and customer with the ability to view, create, and update tickets in Microsoft Dynamics 365, which syncs to Zendesk. 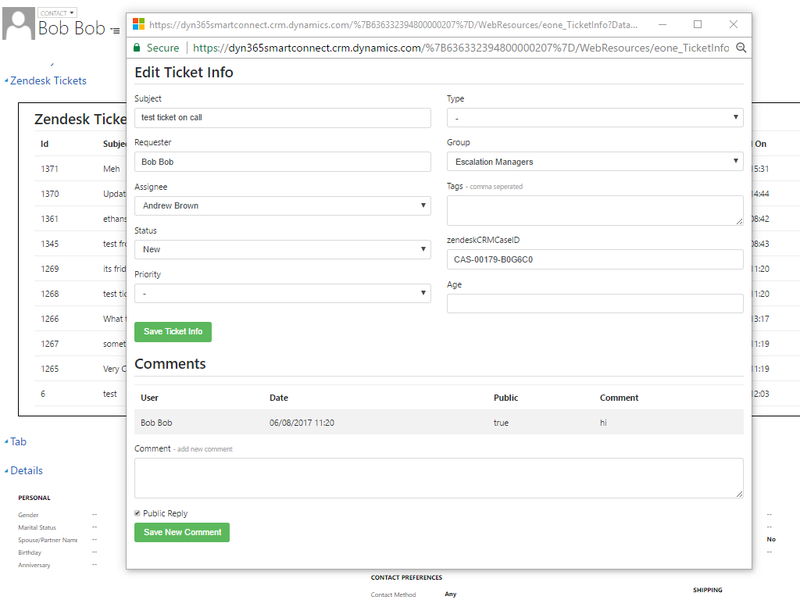 Improve productivity and workflow efficiency by applying Microsoft Dynamics 365 reporting and analytics tools to Zendesk ticket data. Measure customer satisfaction and trends to gain a complete view of your Support and Sales team operations. Load and Install the Zendesk for Dynamics 365 solution in your Dynamics 365 instance. Complete the configuration page for the solution within Dynamics 365 to allow Zendesk ticket data to pull down to Dynamics 65 and 365info to display within Zendesk. Complete the setup page within Zendesk for the Dynamics 365 Connector app. This determines which 365 instance this account will connect to. For the complete install and setup instructions, along with the required Dynamics 365 solution file, head over to the eOne Solutions web site.